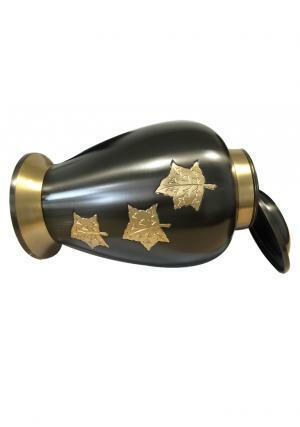 Hand casted from highest quality brass, the Dove Falling Leaves Urn is a beautiful memorial item for any setting. The outstanding finish is achieved by combining black brushed pewter with a polished brass autumnal leaf design, representative of the natural stages of life and death. 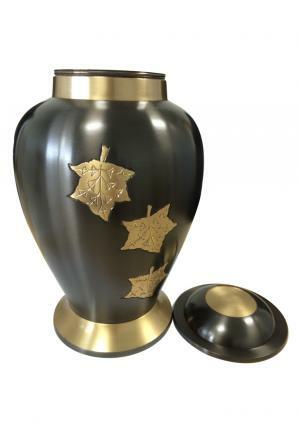 The polished brass in the leaf design is echoed in the collar and foot of the urn, while the subtle black of the pewter lends a sombre and plenty of air to the finished piece. 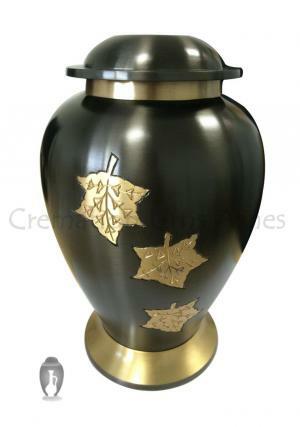 The falling leaf design has been hand created for this urn. 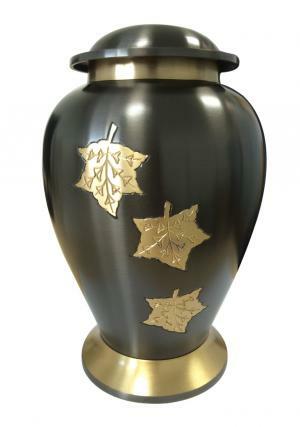 Please note the same design is available on our Dove Falling Leaves Keepsake Urn, which is designed to hold a small quantity of ashes as a personal memorial. This full sized Dove Falling Leaves Urn will hold the full ashes of an adult. 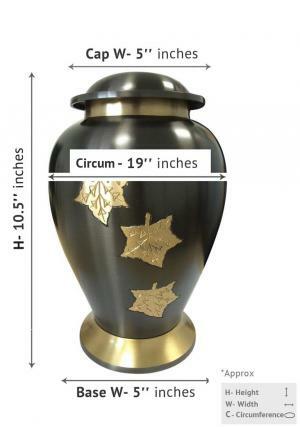 Personalising an urn can add an extra level of meaning to your memorial. Commonly, urns are personalised with the name and dates of the loved one you are cremating – or with the date of the cremation itself. You may also wish to include a favourite quote, or a phrase that holds special meaning for you and your family. Lines and quotes from favourite or appropriate poems are often used as well. If you would like any assistance with your personalisation, for example in knowing whether the phrase or quote you have picked will fit comfortably onto the brass, please ask. Our customer services team can be contacted by phone or by email. You’ll find us on 020 37275556, and at cs@cremationurnsashes.com.